Greg will give a book reading and talk about Shaken Baby Syndrome and the work of Reagan's Rescue at the Danville Public Library on November 27, 2018. The public is invited to attend. Launched in October 2013 for more than five years now, an advertising campaign on the side of Danville city buses continues to spread awareness of Shaken Baby Syndrome. Keep your eyes open for these pink signs. Check back here for an announcement concerning future child abuse awareness projects. Boyd's Bears Spring/Summer 2008 line included a bear named in memory of Reagan Emery. 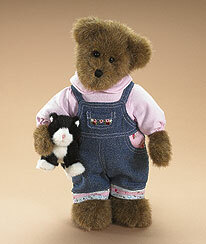 The bear, now retired, was offered locally at Dena's Hallmark in Towne Centre in Danville, Illinois. Boyd's donated 12 bears for us to use in fundraising efforts. We thank the company for its generosity. Let us know if you still want a Reagan Emery, and we'll pull a few strings to find one.